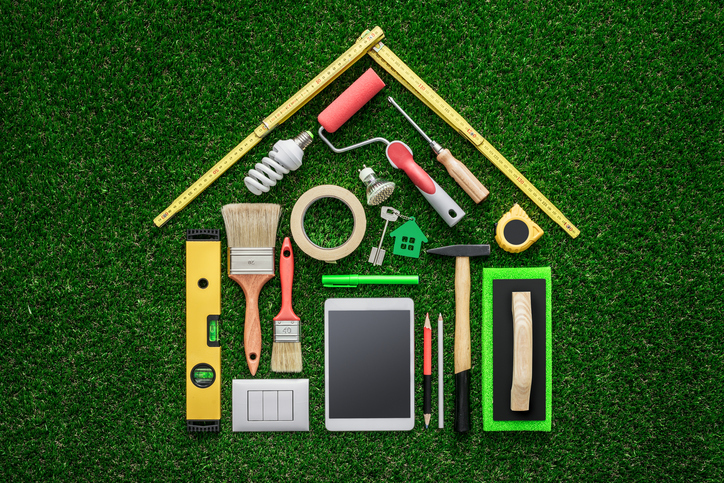 Home improvement projects can vary in difficulty and complexity, depending on what you hope to accomplish. Painting a wall or putting up a few shelves is much different than doing electrical work or trying to build an entire addition to your existing home. Cost, in particular, can be an important factor for homeowners looking into various home improvement projects. If you’re looking to install or replace siding and windows, it pays to hire a professional. While many DIY homeowners claim to be experts, there are a number of ways for things to go wrong. Only a trained and certified professional can ensure your home improvement project is completed properly and safely. There are several reasons HardiePlank® fiber cement siding is the most popular siding in the U.S. It can be purchased in a variety of textures to match the diverse style needs of homeowners across the nation, is available with ColorPlus® Technology to provide optimum weather and fade resistance and boasts unparalleled longevity and durability. At Allied Siding and Windows, we’re so confident in HardiePlank that we offer a 30-year transferable limited warranty. Fiber cement siding also offers superior fire and storm resistance when compared with past siding material options. Investing in HardiePlank with ColorPlus Technology is a smart move as a homeowner, but only if you’re reaping all the benefits that have led to its increasing popularity. That’s one of the reasons it’s so important to trust a reputable contractor with experience installing this advanced siding material correctly. If installed incorrectly, the fiber cement siding can actually trap water within the walls of your home. This excess moisture can lead to the formation of mold, damaging the structure of your home and potentially causing significant health issues. Installing windows of any kind isn’t the best project for an amateur to tackle. Being forced to lift and hold heavy framing for extended periods of time could lead to back pain, and dropped glass could cause significant injury. Keep in mind your new energy-efficient replacement windows only provide those money-saving benefits if everything is properly installed and sealed. We carry a diverse array of vinyl, wood, fibrex and hybrid replacement window options from industry leaders such as Andersen, Simonton and Don Young, many of which boast the latest features to provide exceptional functionality and energy savings. Investing in new ENERGY STAR®-certified equipment won’t do much good if improper installation leads to drafty windows. These replacement windows are built to last, but you likely won’t be able to fully benefit from all potential warranties if you risk doing the job yourself. One of the things we’re known for at Allied Siding and Windows is accountability and quality, which is why we follow a detail-oriented 14-point checklist during window installation. We accurately measure, custom fabricate and fit each window for your home. Some other companies, inexperienced handymen and DIYers may attempt what’s known as “forcing” a standard-sized window into an existing opening, often in ugly and inefficient ways that compromise the window’s integrity and energy benefits. When you hire the pros at Allie Siding and Windows, you can rest assured we’ll never force an improperly sized window, and we’ll always ensure your new replacement windows look beautiful before we leave. We also simplify your life by disposing of your old windows free of charge, so you don’t have to deal with hauling them to the dump or have them sitting around for big-trash pickup. Allied Siding & Windows is committed to providing professional service to all our customers. We take our responsibility seriously, which is why we take every precaution to ensure all Crew Members and Crew Supervisors comply with all company policies and ethical standards. Allied’s installation crews receive quarterly training directly from our product manufacturers to ensure optimum performance and safety. Furthermore, our teams will complete their work with as little interruption to your lifestyle as possible. Contact Allied Siding & Windows today for a no-cost quote, or visit one of our Texas locations to speak with a professional today. 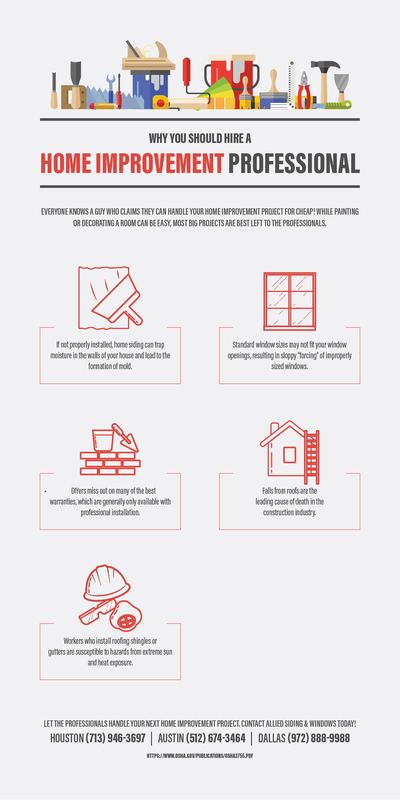 See our infographic below for quick tips on why you should hire a home improvement professional.